Leicestershire have signed New Zealand international all-rounder Scott Styris as their second overseas player for this season's T20 Blast. Styris, 38, has previously played 20-over cricket for Essex and Sussex, for whom he scored the then joint-third-fastest 100 in Twenty 20 history. He has also played for the Deccan Chargers and Chennai Super Kings in the Indian Premier League. Top score of 106 not out. Averages of 26.5 runs per game. Best figures of 3 wickets for 5 runs. 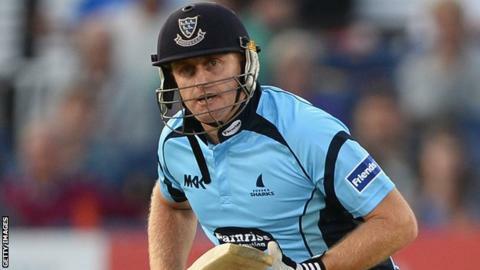 Scored 100 off 37 balls for Sussex against Gloucestershire in July 2012. Styris joins Bangladesh's Shakib Al Hasan in the club's T20 overseas ranks. "Having played in two finals days in the last four years, I feel I have unfinished business in English T20 cricket and want to play a key role for a successful Foxes campaign," said Styris, who made the last four with Essex in 2010 and Sussex two years later. "I love playing in England and am looking forward to working with the team over the next few months. I hope to add value with my skills and knowledge of the T20 game." Styris, who joins subject to visa approval. will be available for Leicestershire for the entire group phase of the event, which the Foxes begin with a clash with Derbyshire on 16 May. "I'm really pleased that we've managed to get a high-profile player like Scott as our second overseas player," said director of cricket Phil Whitticase. "His record is second-to-none and I'm looking forward to him playing a key role in our side. Scott has vast experience and knowledge and that will be a big help to Josh and the team."